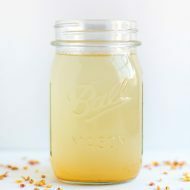 You went WILD over my posts on the health benefits of apple cider vinegar and apple cider vinegar detox drinks, so when I came across this folk remedy using apple cider vinegar I knew I had to share it with you! Enter: fire cider. Ever heard of it? 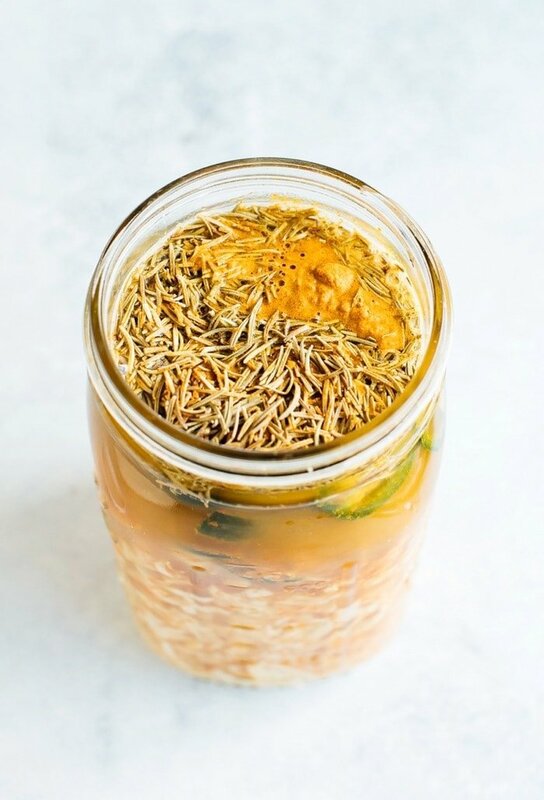 It’s an immune-boosting health tonic that’s been used for decades to naturally protect against cold and flu and ease sinus congestion. There are a few brands on the market (which is how I got into it), but I quickly realized that fire cider is really easy to make at home. Cold and flu season is almost over, but I’ve still been drinking my homemade fire cider regularly because the weather has been iffy here lately (we had flurries this weekend) and a few of our friends have been sick with the flu. Ugh! The base recipe includes horseradish, ginger, garlic, onions, cayenne pepper and apple cider vinegar. If that scares the bejeezus out of you, don’t worry, the last step before drinking is to add honey and any other flavors to sweeten/balance to your liking. So why would you want to choke this down? First of all it’s actually quite tasty… and addicting. Isaac and I have grown to crave the stuff. It’s an amazing balance of spicy, sour, sweet, sharp, herbal — basically every flavor I can describe. Beyond the flavor, it’s packed with health benefits (hence why it’s called a folk remedy). I swear by it as an immune booster and drink extra when I’m starting to feel like I’m coming down with something, but the ingredients in fire cider provide a host of benefits. Apple Cider Vinegar — has so many benefits but my personal favorite is that it’s a digestive aid. Be sure to check out this post for all the reasons ACV is amazing! Horseradish — helps alleviate sinus congestion and headaches. Even chopping or grating horseradish has this effect. If you try this recipe, you’ll see! Ginger — helps with digestion, infections and nausea. Garlic — a secret superpower with antimicrobial and antibacterial properties. Onion — has similar properties to garlic but is also great for preventing (or recovering from!) colds and the flu. Cayenne Pepper — helps move blood through your cardiovascular system. Blood circulation = healing. Honey — soothes inflamed tissues and organs. Using local honey can also help with allergies. I know those ingredients still seem intimidating, but here’s a sneak peek before you get to the recipe: you’re essentially infusing apple cider vinegar with these flavors, straining the liquid and then adding honey to sweeten. There are soooo many ways to enjoy this elixir. I’m excited to make my way through this list! Take a shot (about 1-2 Tablespoons) straight up. Dilute the fire cider tonic with warm water, juice or apple cider. Swap vinegar in a salad dressing for fire cider — this is happening ASAP. Add to fried rice or cauliflower fried rice. Use in Bloody Marys — alcoholic or not! Use as a marinade for tofu, meat, etc. Add to soup or chili. Use as a hangover cure. 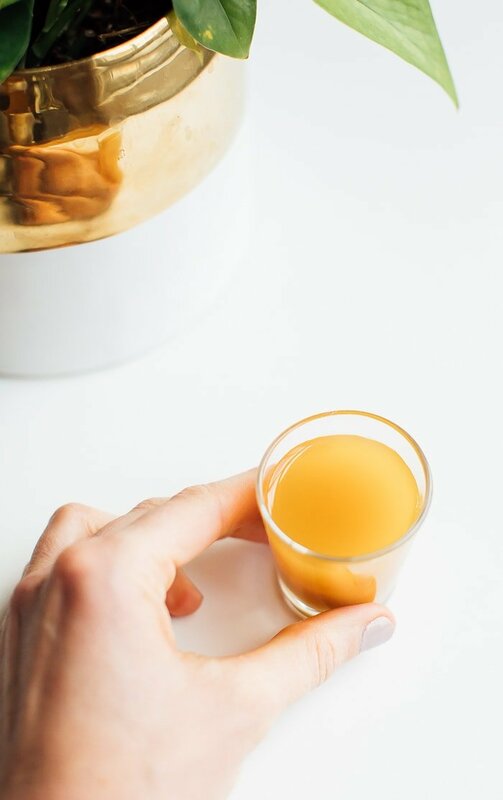 Note: Many people drink fire cider straight up (1-2 Tablespoons) out of a shot glass, but if you’re worried about your tooth enamel it’s best to dilute it with water or another liquid. 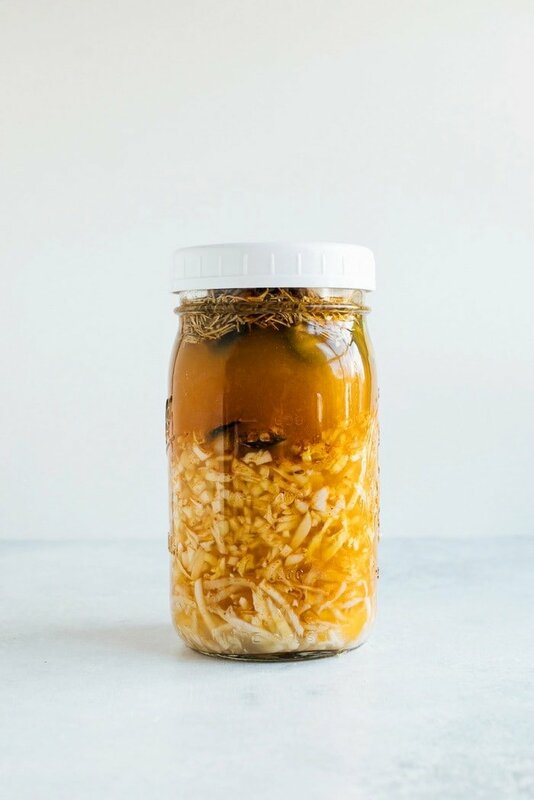 An immune-boosting health tonic with fresh horseradish, ginger, garlic, onions, cayenne pepper, apple cider vinegar and honey. Recipe inspired and adapted from Mountain Rose Herbs. 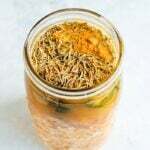 Add ginger, horseradish, onion, garlic, jalapeño peppers, lemon zest and juice, rosemary, turmeric and cayenne powder into quart-sized glass jar. Pour apple cider vinegar in the jar until all the ingredients are fully covered and the vinegar reaches the top of the jar. You want to be sure all the ingredients are covered to prevent spoilage. Use a piece of natural parchment paper under the lid to keep the vinegar from touching the metal, or use a plastic lid if you have one. 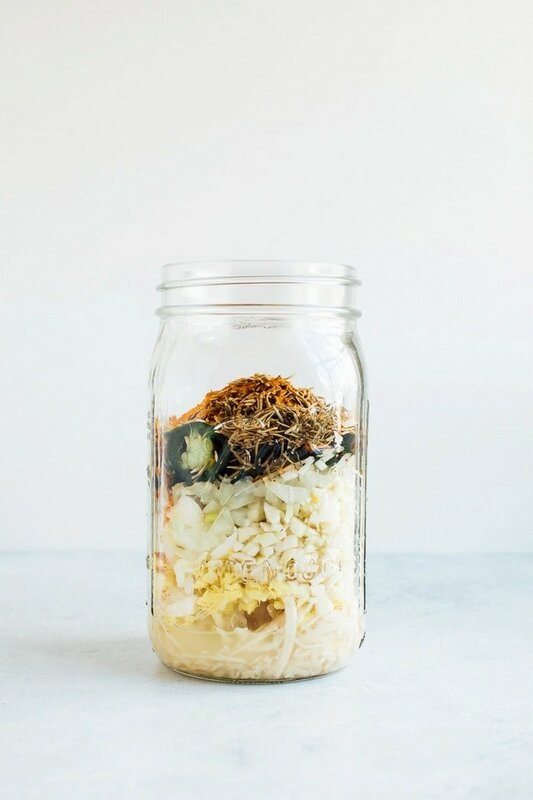 Shake jar to combine all the ingredients and store in a dark, cool place for 4-6 weeks, remembering to shake the jar a few seconds every day. After one month, use a mesh strainer or cheesecloth to strain out the solids, pouring the vinegar into a clean jar. Be sure to squeeze out as much of the liquid as you can. This stuff is liquid gold! The solids can be used in a stir-fry or you can compost/discard them. Add honey to the liquid and stir until incorporated. 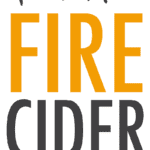 Taste your fire cider and add more honey if needed until you reach your desired sweetness. Store in a sealed container in the refrigerator or in a cold, dark place. 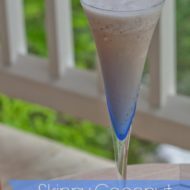 Drink 1-2 Tablespoons when needed. Feel free to make this recipe your own with optional add-ins like cinnamon, orange and grapefruit. 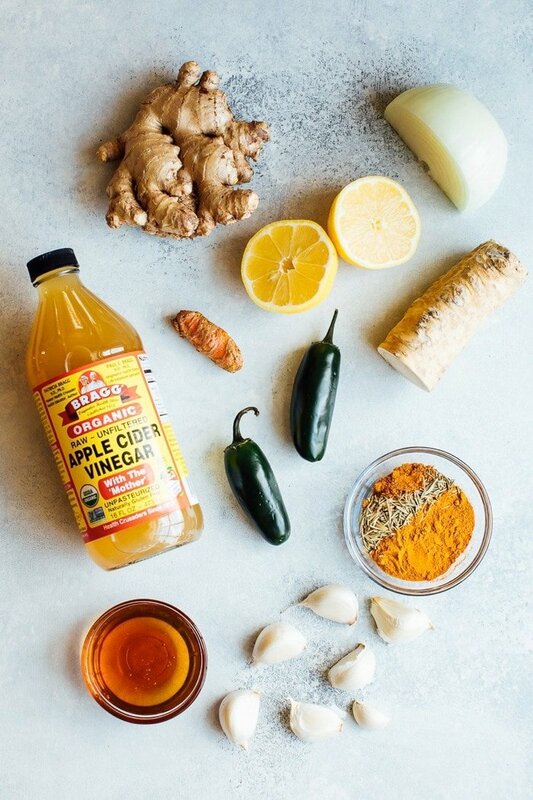 Have you tried fire cider (or any other folk remedy) before? Let me know in the comments! I’m all about natural and holistic remedies like fire cider and I’d love to learn (and share) more. Haha Brittany, I saw raw onions and garlic and the bejeezus quite literally left my body. I’m sure it’s super good for you though! Is that rosemary in your image too? Hey I’m excited tp try this. Do i need to stick them in boiling water like you do canning to seal?or is clean from the dishwasher fine? Can I make this with pasturised, unfiltered acv? unpasteurized would be MUCH better as it is a living food with benefits that are lost if pasteurized. you would still get some benefit using pasteurized vinegar i reckon. It should keep for a few months at room temperature for a few months but if you store it in the fridge it should keep 1-2 years. Hope this helps. Does the ginger need to be peeled? Ginger doesn’t need to be peeled most of it’s grown hydroponically anyways, everything should be organic and I threw everything except the jalapenos, rosemary and onions into the blender at medium grind and it works fine everytime if you strain it out at the end. So, what if I stupidly added the honey to the mix from the start? Other than being a sticky mess when filtering do you foresee any issues? Brice, I did the same thing. Thoughts anyone? Is this a tincture or not? I feel frustrated by the lack of clarity between tinctures, potions, and brews. Please advise. I made mine on 12/10/18. Been in the fridge the past few months and I’m straining the liquid today. I hate tossing the leftovers and wondering if I could add more Apple cider vinegar to the leftovers and brew another batch. It wouldn’t be as strong, but might work. Thoughts? What happens if its been setting for 10 weeks? Is it still salvageable? This first time making it and then family issues happened so was forgotten about.